Participating Rotary clubs and Rotary districts run the RIBI technology tournaments annually. These events usually take place in a large school or civic hall and enable many teams to take part from neighbouring local schools & colleges. Students have to use team-building skills to solve a design and technology problem, as well as to use oral, written and graphical communications skills to compile a project portfolio. 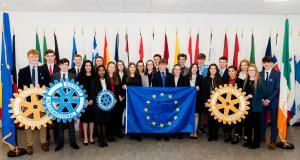 The tournaments are a one-day event for teams of four students from local schools and colleges, and they undertake to collectively solve the previously unseen task in a given period of time under Rotarian supervised tournament conditions. The task is consistent with the requirements of the national curriculum and its execution develops team building, communication skills, planning and time management, as well as solving the design and technology task.